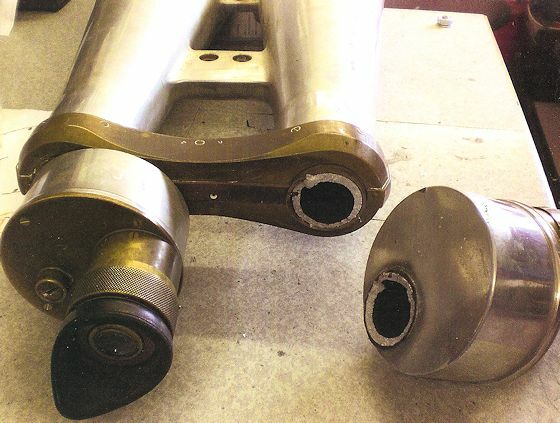 The following pages of photos illustrate some of the instruments serviced and repaired by Optrep – giving an overview of the range of our work. - especially WW2 types from size 7x50 up to the very largest. Also, very large modern binoculars are of interest. Send us details, especially photos, for our offer. 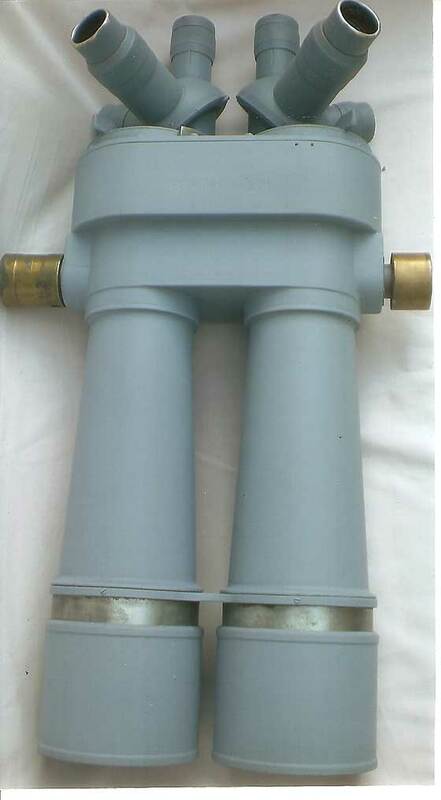 Widely differing instruments serviced include a WW2 Imperial Japanese Navy 22.5-30x180mm binocular. 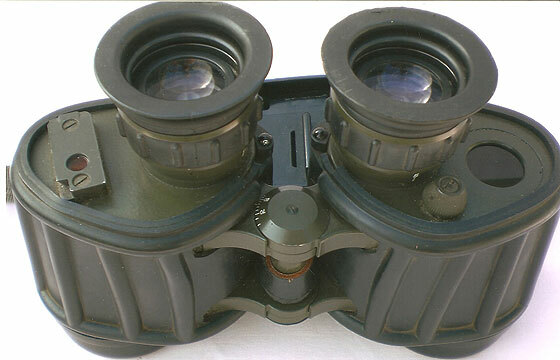 The 180mm IJN binoculars have the two-power eyepieces mounted on turrets that can be rotated to present the eyepieces required for use; this binocular is 1.04m (41 inches) long and weighs a hefty 64kg (141 lb). Once serviced, this giant binocular was filled with nitrogen, this being standard practice at Optrep for sealed instruments. 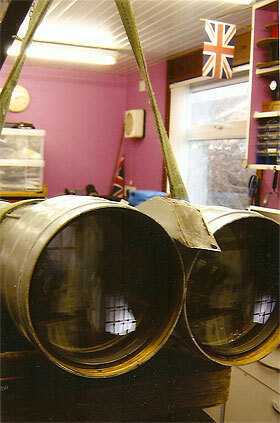 IJN 180mm binoculars in the Optrep workshop. Top: Ross 9x35 (7.3° field) ‘Stepruva’ and, Bottom: Kershaw 8x30 (8.7° field) ‘The Olympic’, both pre-war designs but continued after the war in improved form into the 1950s. Sometimes underrated, such British designs had excellent optical specifications and layouts, were made of first class materials (e.g. Elektron body castings, phosphor-bronze prism straps) and were a pleasure to use. 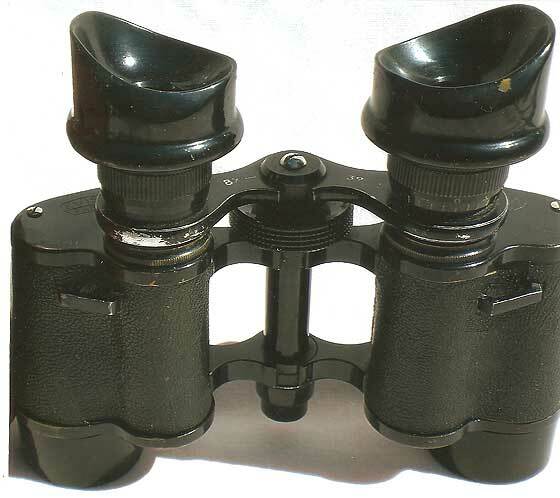 As Ed Castle, owner of the Stepruva said: ‘Many thanks for the excellent work you have carried out on my 1950s Stepruva binoculars….. I’d aquired them in cosmetically good condition, however the centre pivot had seized almost solid and the internal optics were cloudy and marred by fungus. All the faults have been cured and the image is now crisp and bright, they are now a pleasure to use – like a new instrument. I’m very impressed, thanks again’. If one asks why did most of the excellent British companies disappear, the answer in a word is ‘betrayal’. Companies such as Ross, Kershaw and Wray were bought up only to be asset stripped, mainly for the land they stood on. This excellent Ross 13x60 ‘Enbeeco’ binocular used the same basic body as the ‘Stepruva’ above but with different eyepiece optics and larger object lenses and barrels. It is well balanced and easy to handle. ‘Enbeeco’ derives from the previous Newbold & Bulford Company. Ross 9x35 ‘Solaross’. 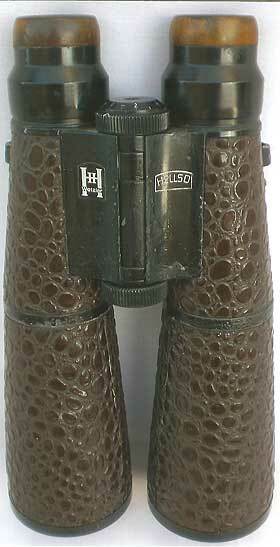 The Solaross range of binoculars was the last made by this great British company. Extensive use of plastic mouldings had the aim of mass-producing a ‘modern, streamlined’ design. It was only necessary to change the eyepiece lenses, the object lenses and barrels to produce different models. Sadly, the Solaross did not save the company which was bought up only to be asset stripped, mainly for the land. 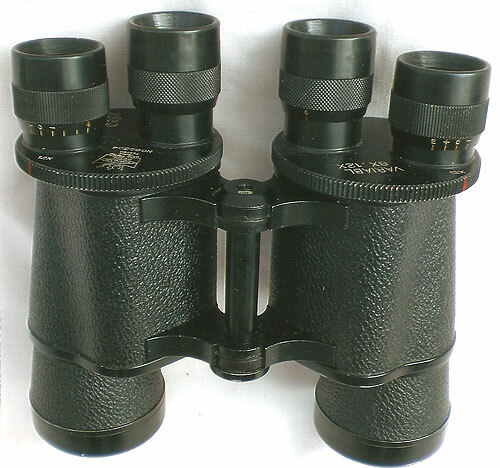 Another British binocular, the 12x50 Vanguard, was introduced in 1947. It has an internal focusing system (but the eyepieces move) and was an excellent exercise in ‘streamlining’. Very expensive for its day (£48), there was also a 10x50 and 7x50 models available. 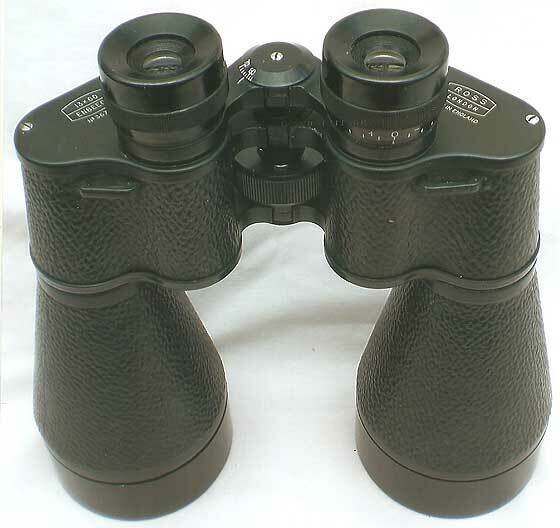 A modern Fuji 40x150 "Meibo" binocular. 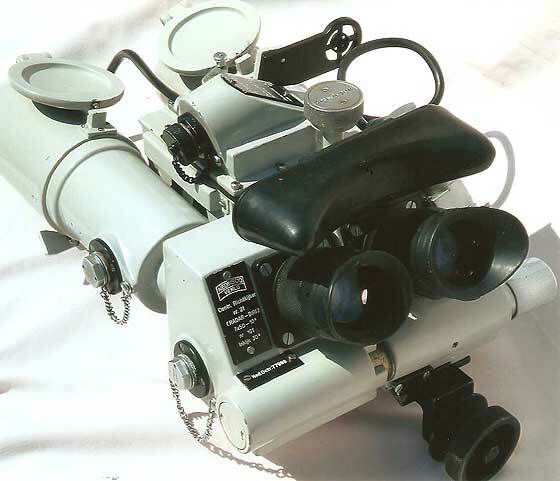 A post-war PNB-2 25x100 (45°) binocular, sometimes called the ‘Border Guard’ model. 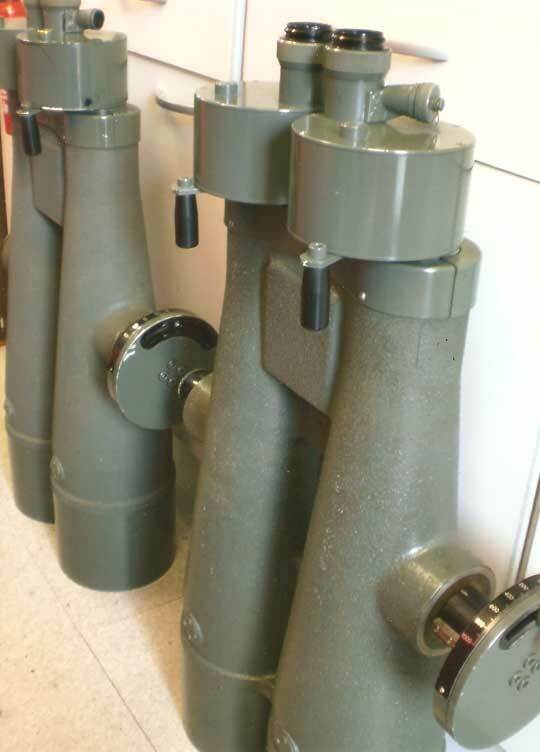 A Just arrived in the Optrep workshop for servicing are these two large binoculars: JB-88 (Kowa) 35x150 (nearest) and 40x150. Each weighs 30kg (66lb) and measures 84cm in height and 38cm in width (at the objective lens end). 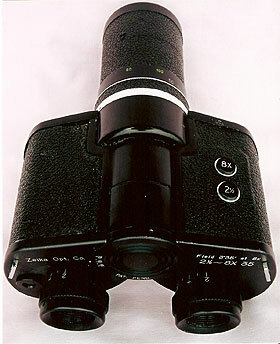 An unusual, single objective binocular from the 1970s – the Zeika 2.5-8x35 electric zoom binocular. 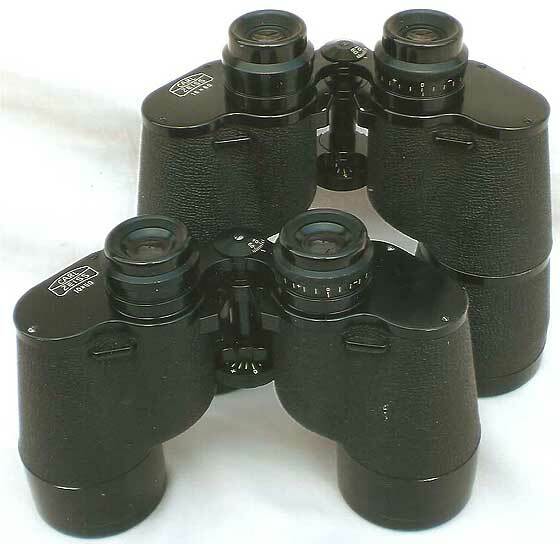 Carl Zeiss EDF 7x40 binoculars (1981 onwards). These incorporate an infra-red detection device on the left and a radioactive fluorescent capsule to illuminate the right graticule (when the lever is moved). Special optics are resistant to radiation. Another 7x40 military binocular, this time of Russian make and 1985 vintage. It is not particularly aesthetic to look at but has a wide angle of view and an outstanding optical performance. Zeiss 7x40 NVA. In production from 1968 until about 1981, these were used by the NVA (Nationale Volksarmee of the former DDR). Very well made throughout and with excellent performance. The larger, top prisms have acutely tapered bases. The rainguard (seen in the background), OG covers and heavy-duty strap are all reminiscent of those on the Russian 7x40 shown previously. Also, an infra-red detection device and radioactive fluorescent plate for illuminating the graticule are systems similar to the previously shown EDF 7x40 (also used by the NVA). 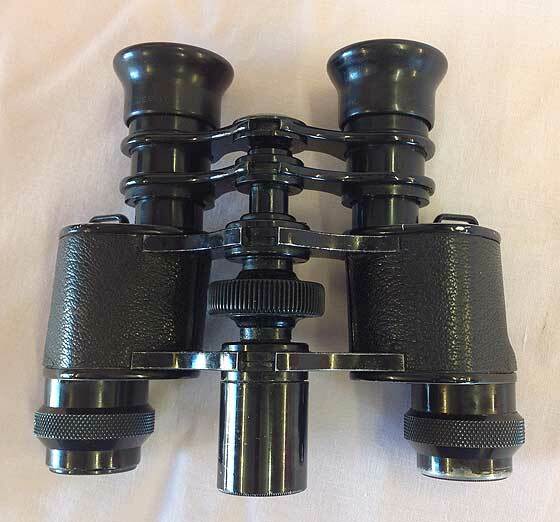 This ELVISA (Paris) 8x32 CF binocular has hollow metal rolled eyecups, a French manufacturing speciality and used for many years in their opera and Galilean field glasses. 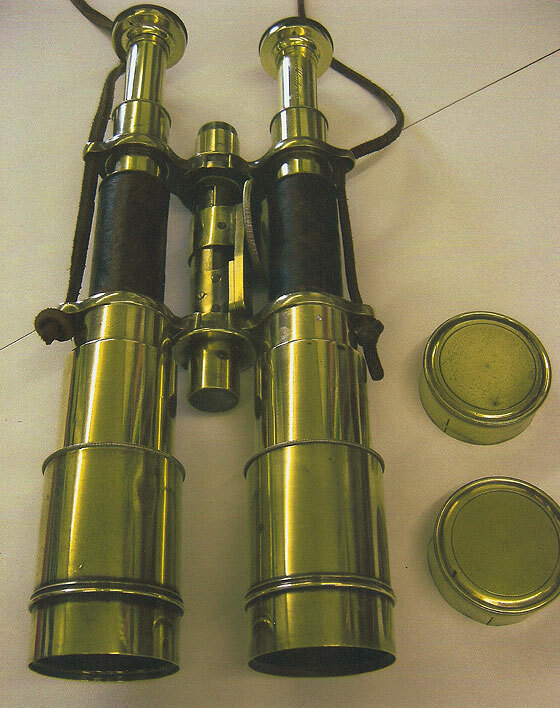 Further examples of the French technique of using metal hollow rolled components such as eyecups are these two double telescopes from the early 1900s. The aluminium example on the left has 35mm object lenses and wheels for adjusting the focus and the pupillary distance. It measures 31cm when extended and weighs 0.682 kg. In those days, aluminium was very valuable. A French inter-war binocular of unusual construction. The porro prisms are mounted on a flat central plate and there is no P.D. adjustment. 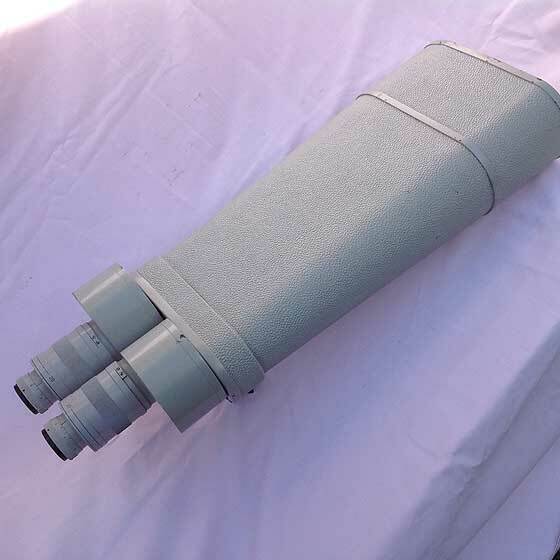 The eyepieces and objective lens cell guide tubes are also mounted on the central plate. The prisms are enclosed by a single-piece curved housing. 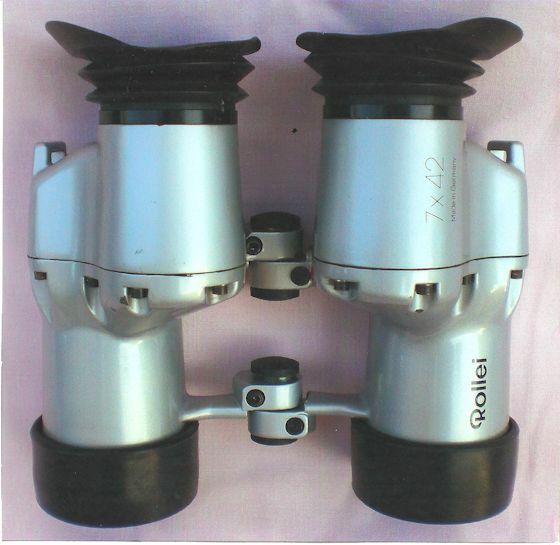 These Rollei 7x42 fixed-focus binoculars repaired by Optrep were made under licence in Germany. They were based on the British AVIMO 7x42 made in a rubber- armoured form during the 1980s for British troops, police and NATO forces. The Rollei version was intended for civilian use (hence the ‘attractive’ silver finish) although they still have the military graticule. 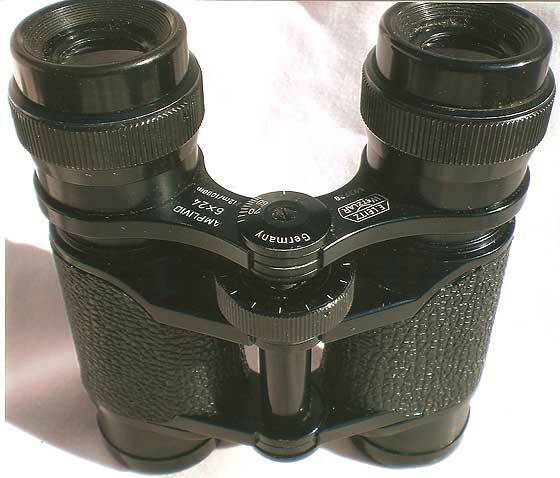 This binocular is fully sealed, nitrogen purged, weighs 1.1kg and has high quality optics. Today, the Russian BELOMO factory in St. Petersburg make copies of this binocular. 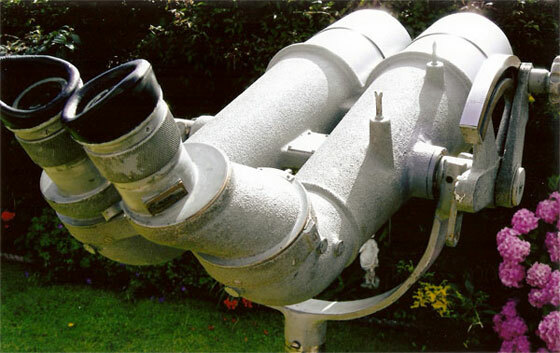 A British AVIMO warship binocular, type G389/1, fitted with electrical heaters and internal filters. 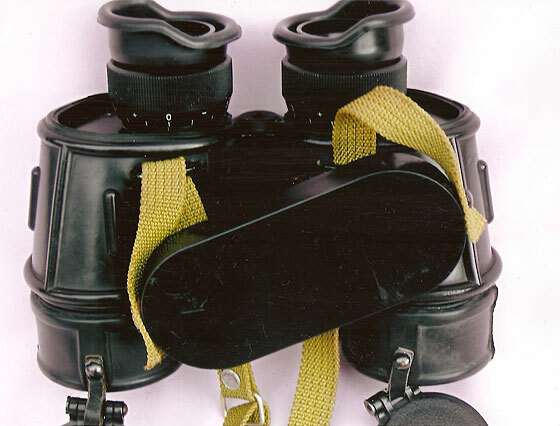 These binoculars, with many curious and unusual features, were, together with the smaller type G386/3, the last types designed by AVIMO before the company was absorbed by Thales. 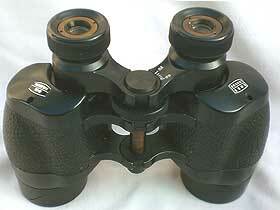 This type of binocular is used by the Royal Navy and many other country’s navies. 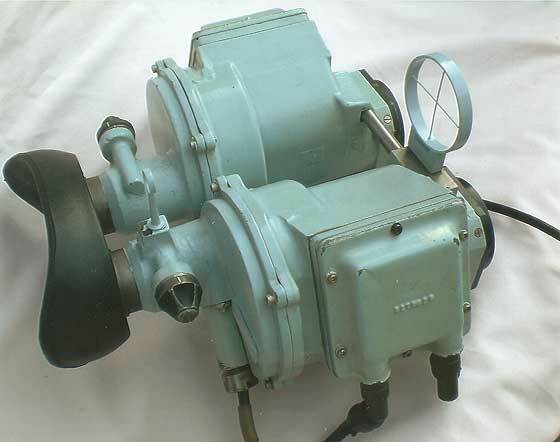 A Nedinsco 7x50 ‘Radar-Biri’ Director binocular of 1960/1970 vintage. This type was mounted beside (and to direct) the radar dish on Swedish destroyers. 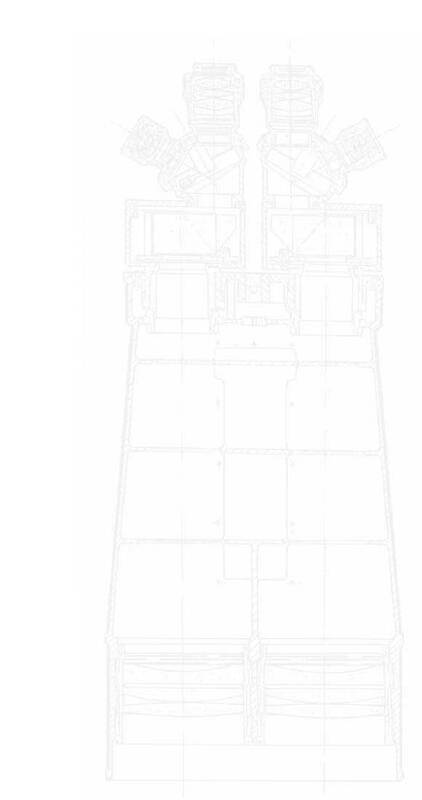 It is a very complex instrument and has various electrical and mechanical connections to the radar unit. 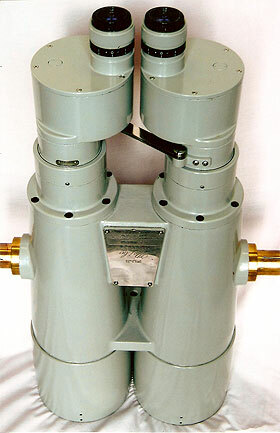 One of the two modified Porro II prism units from a Nedinsco 7x50 ‘Radar-Biri’ binocular as above. 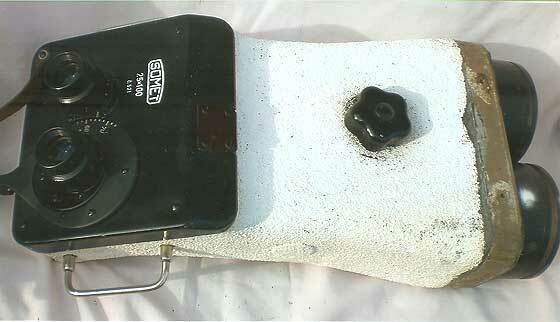 The prisms are not cemented but held in place mechanically with an air gap. 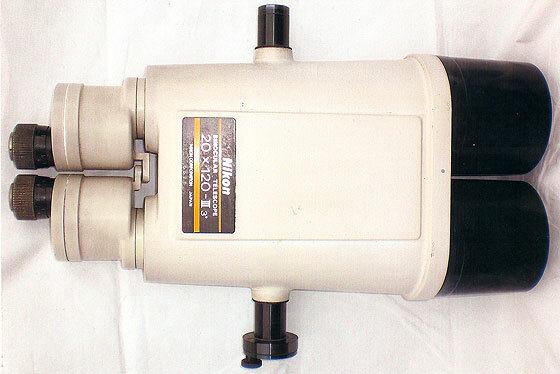 The left prism in the picture faces the eyepiece and has a sloping face. 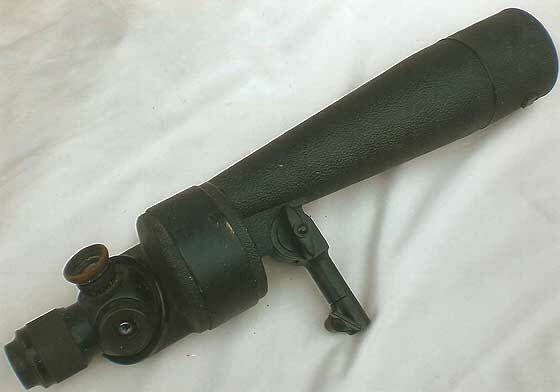 These NIKKO 15x105 WW2 Japanese binoculars (with 60° inclined eyepieces) suffered a severe blow – cracking the body casting where the right trunnion mounting attached. 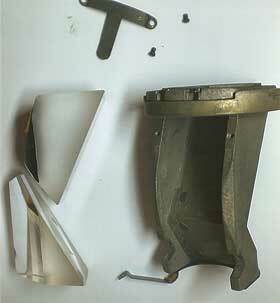 Fortunately, Optrep was able to repair and steel reinforce the casting and mounting as the other photograph shows. We buy World War II binoculars. Send us details with, if possible, a photograph, and we will make you an offer. Large military binoculars are today often seen being used for peaceful purposes, the following examples being used to study wildlife in wonderful reservations in Africa. This WW2 Japanese ‘Toko’ 20x120 binocular (180) suffered a bad fall from its tripod. 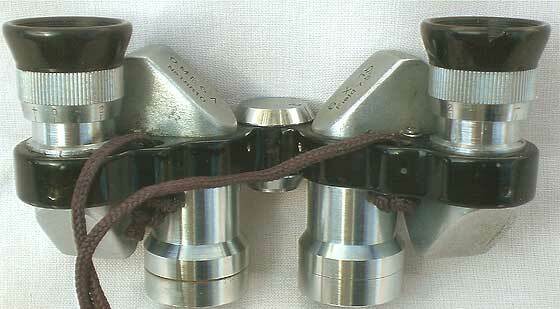 Apart from the right prism housing being sheared off, the left housing was buckled, some prisms were chipped and the right eyepiece was badly damaged. After repair and restoration by OptRep, the binocular was once again back in service in its home in the Grumeti Reserves, Mawalla Park, Arusha, Tanzania, Africa. 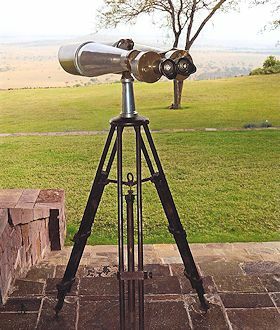 Illustrated is a WW2 Japanese ‘Nikko’ 15x105 (60° angled) binocular (1773) at Sirai House in the Borana Conservancy near Nanyuki, Kenya, just north of the Equator. After repair and overhaul in the OptRep workshop this binocular was unfortunately damaged en route back to Kenya. 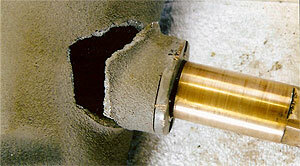 Tony Kay was therefore commissioned to travel out there to carry out repairs in situ. 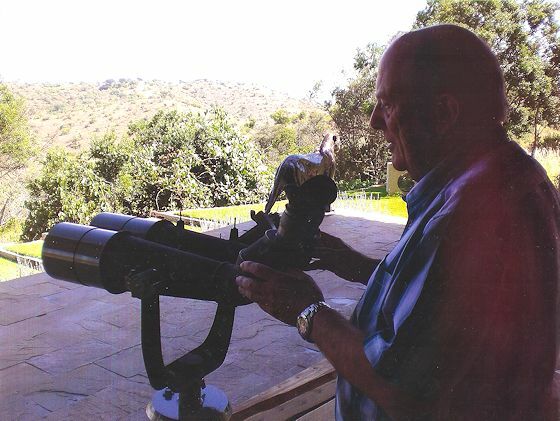 He is seen here giving the binoculars a final test. An example of the rare and intriguing Carl Zeiss 3x20 ‘Teleplast’. This binocular, along with the smaller 5x model, was an early Zeiss foray into making a compact, folding binocular but, with its Sprenger prisms and triple-element field lenses, it proved to be too expensive to make and so was only in production from 1907 to 1911. Most were sold in Argentina and Uruguay. 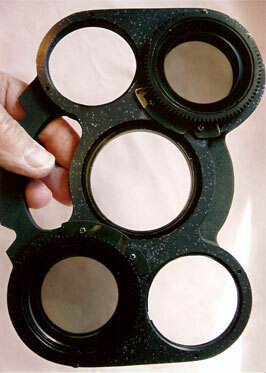 Overhauled by Optrep, 25mm deep eyecups were made, based closely on photographs. This Teleplast had a maximum width of 205mm and weighed 730g. 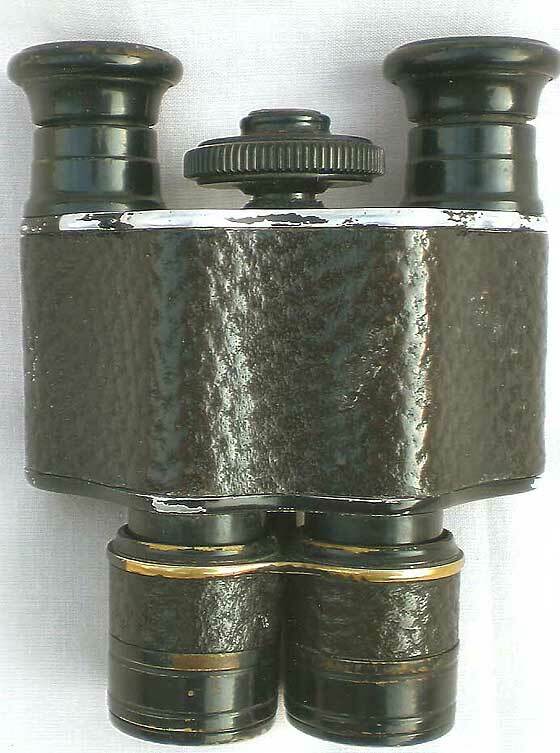 A tiny Carl Zeiss 3.5x15 'Theatis' prismatic binocular, one of the finest pocket binoculars made. 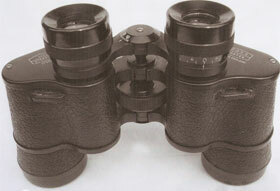 A Japanese Omega 6x15 MCF pocket binoculars. 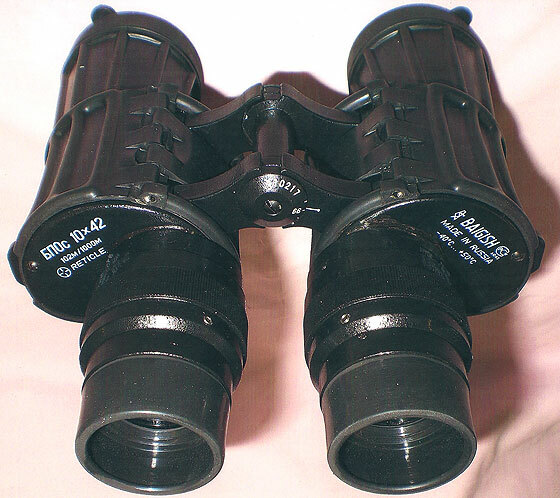 This type of binocular, very popular in the 70s and 80s, came in various sizes up to 50mm. The prisms were held down by metal covers with springs inside. Later, there were MWCF wide angle models. This rare Leitz 6x24 ‘Amplivid’ can be tricky to service. It is unusual in having a combined roof prism and oval mirror unit each side. An excellent performer. Roof prisms are often thought to be very modern but in fact the first roof prism was created by Carl Zeiss of Jena and patented in 1879. Their prism unit, known as the Abbe-König type, is illustrated below and was first used by Zeiss in their twin, rotating eyepiece telescope known as the Dosenfernrohr and then, later, used in their binoculars. 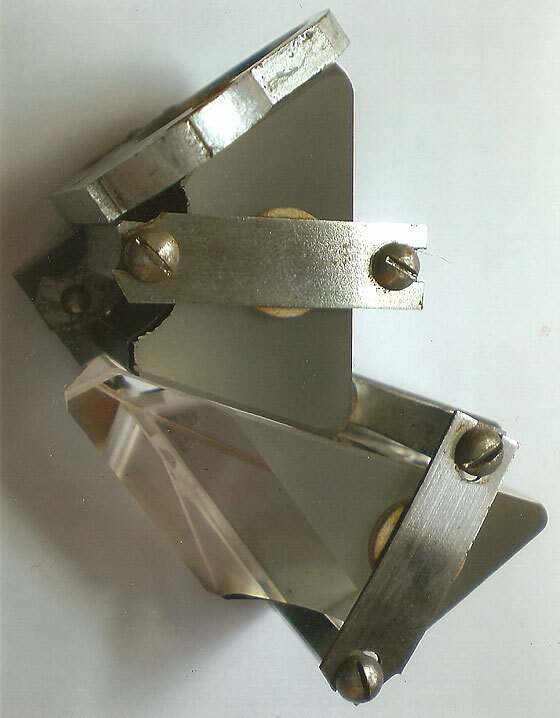 The two prisms were later cemented together to eliminate the air gap between them. There are many other designs of roof prism, the ‘roof’ (reminiscent of a house roof) being the feature that they have in common. 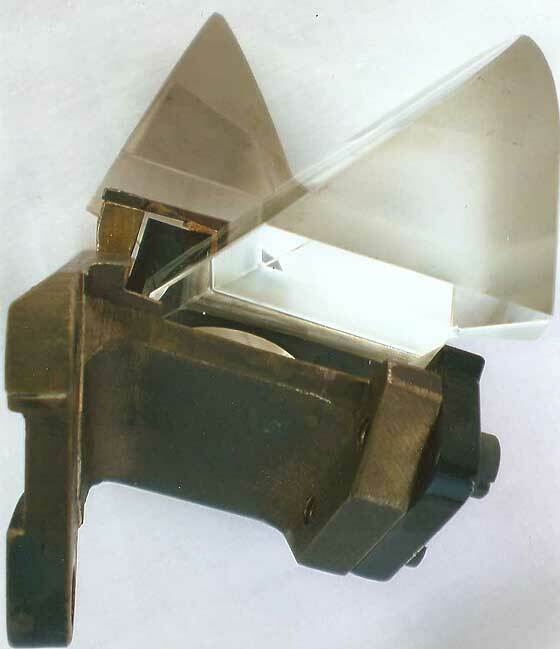 In 1897 Hensoldt of Wetzlar was the first company to use roof prisms in a binocular although the prisms were of the Penta type (later used in SLR cameras). 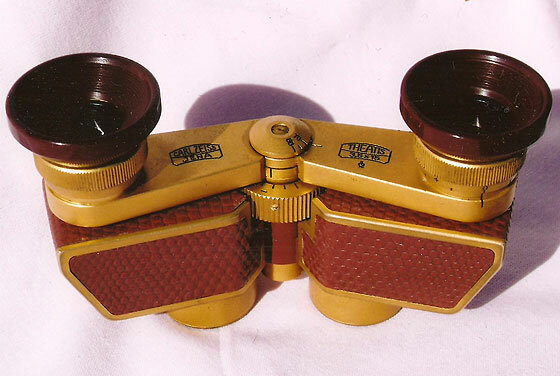 Hensoldt soon followed Zeiss in using their version of the Abbe-König roof prism (the Zeiss patent being short-lived) and they coined the name of ‘Dialyt’ for their roof prism binoculars. The gradual purchase of Hensoldt by Zeiss, beginning in 1928, was completed in 1964 when Zeiss also began using the trade-mark name of ‘Dialyt’ for roof prism binoculars. 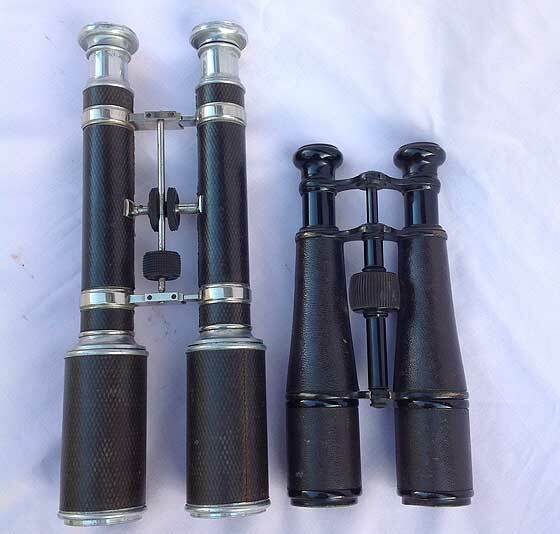 Below are illustrated two Abbe- König roof prism binoculars, serviced by Optrep, left being a Carl Zeiss 10x50 ‘Dekar’(circa 1925) and right being a Hensoldt 10x50 ‘Dialyt’ of post-war vintage. The ‘Dekar’ is especially collectable. 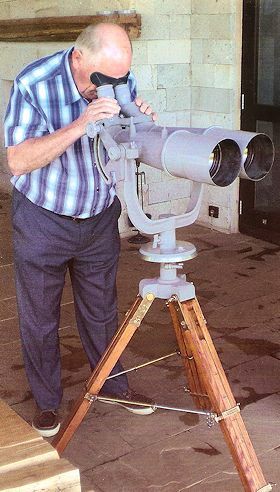 Post-war Hellso, Wetzlar, (Hans Hensoldt, grandson of Moritz Hensoldt) 9x63 ‘Aero-Nox’ Abbe-König binoculars.The prism unit each side is mechanically held in an elegant die-cast frame (see right photo). The main focusing wheel is at the front while the rear wheel (nearest eyes) is for right eyepiece dioptre adjustment. This 1937 Carl Zeiss 8x40 'Deltarem' came into the Optrep workshop as something of an interesting rarity. Zeiss appear to have gone all out for a wide angle of view and achieved 11.2°. However, the price paid for this was an uncomfortably wide binocular (20cm) with a weight of 1kg and a very shallow depth of field. The 'Deltarem' had massive prisms (with wedge-shaped bases) and highly-curved field lenses. 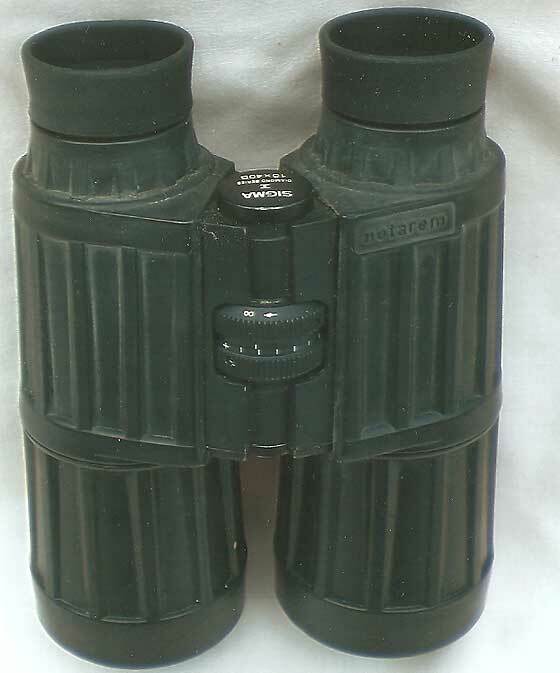 There was also a 'Deltar' model with independent-focusing eyepieces. 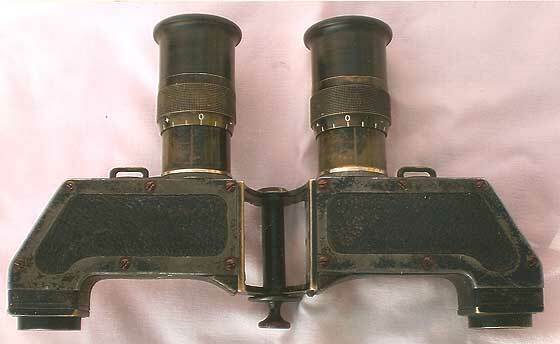 Two examples of Carl Zeiss (West) porro prism binoculars with front focusing wheels: 10x50 and 15x60. A rubber armoured version of the Carl Zeiss 10x40 B ‘Notarem’, with a SIGMA logo. Notarem compents were all of high quality but were not always put together very well. Once overhauled by Optrep the assembly is much more rugged and reliable, resulting in a fine binocular. A rare binocular telescope after restoration in the Optrep workshop. It was made circa 1850 by G&S Mertz (München) and its specification is 10x (approx.) with 35mm object lenses. Each side has four lenses and an air-spaced object lens. 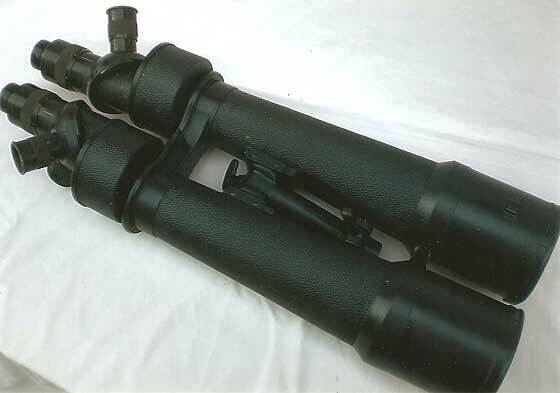 The eyepiece tubes are telescopic and focusing is by the rack and pinion mechanism. There is a hinged dust shutter inside each eyecup. Fully extended the instrument is 11” (28cm) long. 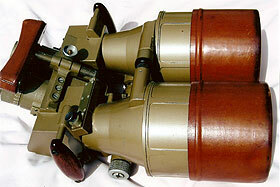 A rare Carl Zeiss 5+10x24 ‘Marine-Glas m.Revolver’ dual- power, turret binocular. 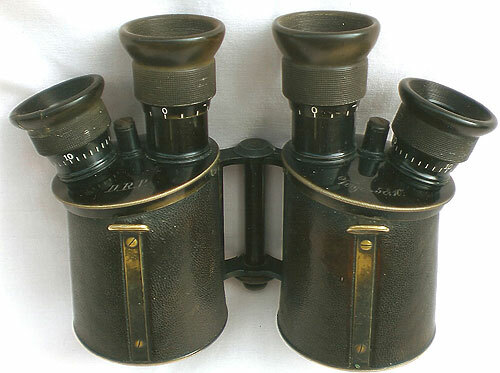 Made from 1896 until 1904, it was known as the ‘Admiral Togo Glass’ because this Commander of the Japanese in the Russo-Japanese war of 1904/05 used one of these binoculars, as shown in photos. The construction of the body, objective cells and the method of holding the prisms are all similar to those used in the famous singlepower ‘Feldstecher’ binoculars. 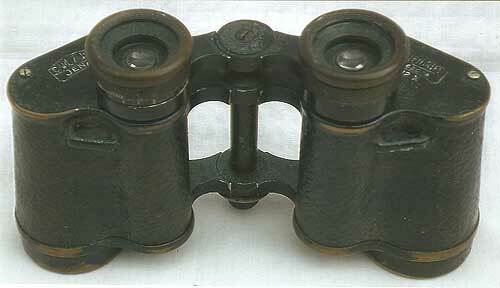 Other examples of turret binoculars were made by Emil Busch (12+20x80 of WW1) and Carl Zeiss (12+20+40x80 of WW2). A very rare example of the 1913 Carl Zeiss ‘side focus’ 12x30 ‘Telefortem’. It is rare because both eyepieces were focused in unison by twisting the right eyepiece, the left eyepiece having the independent dioptre adjustment. This system worked because the binocular’s depth of field is very shallow and so the amount of movement to focus is very small. However, only 39 examples were made before Zeiss switched production to the 12x30 ‘Telefortem’ with centre-wheel focusing. Optrep are proud to have serviced and repaired what is probably the last original ‘side focus’ Telefortem in the world. This very rare Carl Zeiss (Jena) 12-20-40x80 prismatic, turret telescope, serviced and repaired by Optrep, was made for artillery use just before or during WW1. It has a PoroII prism unit and an air-spaced object lens. 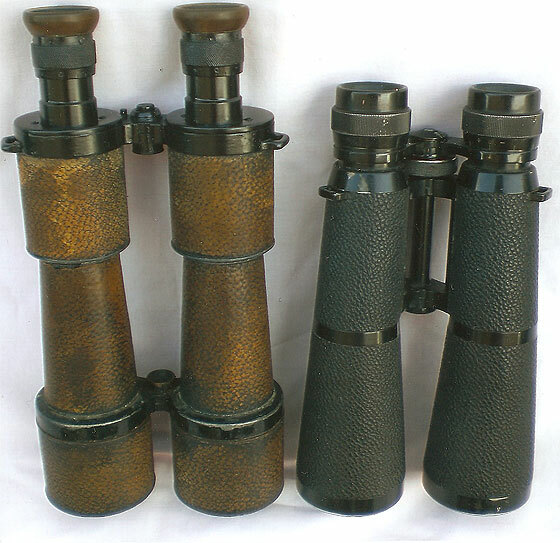 Although the eyepieces and turret are very similar to Zeiss turret binoculars (originating in the early 1900s), the barrel is parallel and not tapered. Maximum length is 550mm. A Carl Zeiss 12-24-42x60 ‘Starmor’ prismatic turret telescope for astronomical use. 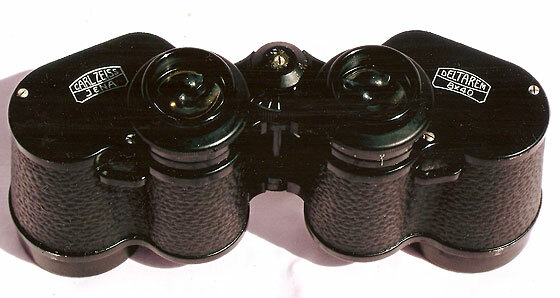 The turret dual-power binocular was continued after WW2 by Carl Zeiss (Jena), for example. A rare example is this Japanese K.O.C. ‘Scanlux Royal’ 8+12x50 ‘Variabl’ (6.5° and 5°). Below the turrets these binoculars are of a standard 50mm ZCF design, ingeniously adapted. It can be slightly awkward using the smaller 12x eyepieces since the longer eyepieces tend to be in way of focusing the smaller eyepieces. 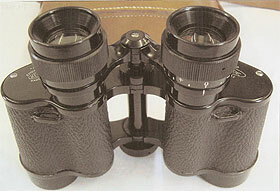 However, the binoculars are well balanced, light and a pleasure to use. 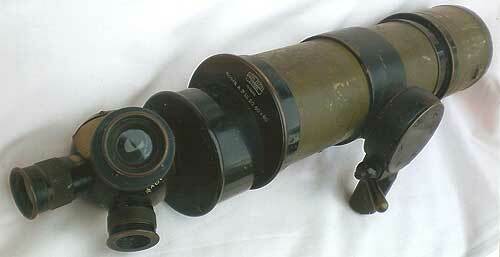 The Carl Zeiss 12-20-40x80 turret binocular (generally called Asembi) was used from WW1 and by the Kriegsmarine in WW2. The design remained largely unchanged, one of the few changes being that the air-spaced objective lenses were replaced by cemented ones in later models. The prism housings can be swivelled to alter the P.D. and can be swung outwards to allow two watchers to use it as two telescopes observing the same target. Italian binoculars are quite rare and so it was all the more surprising that this collection of 1950s vintage binoculars came in together into the Optrep workshop. San Giorgio (Genova-Sestri) 8x30 ‘Lataocta’ (IF). Officine Galileo 6x30 Fert-C (CF). At the rear is a Fratelli-Koristka 7x50 (IF). 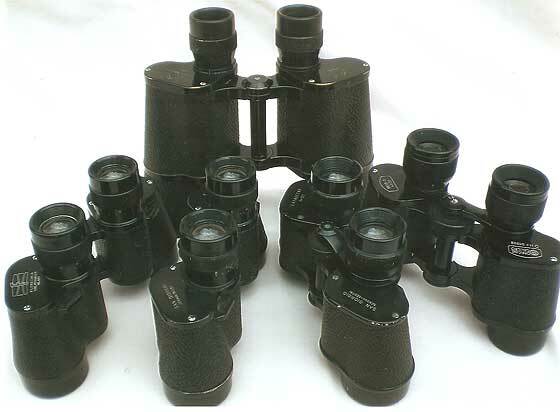 These excellent Nikon 20x120 (III) binoculars were repaired and overhauled by Optrep for the Greater London Authority. They are positioned on the roof of County Hall to give visitors views across London (Tower Bridge, etc). Weighing 15.5 kg these binoculars measure 680mm long by 452mm wide. A Carl Zeiss (Jena) 20x/40x80 observation binocular of excellent performance and often favoured by astronomers. The large barrel on each eyepiece is rotated to obtain one of the two powers. Focusing of each eyepiece is by turning the eyecups. This binocular is 59cm long and weighs a reasonable 7.5kg. 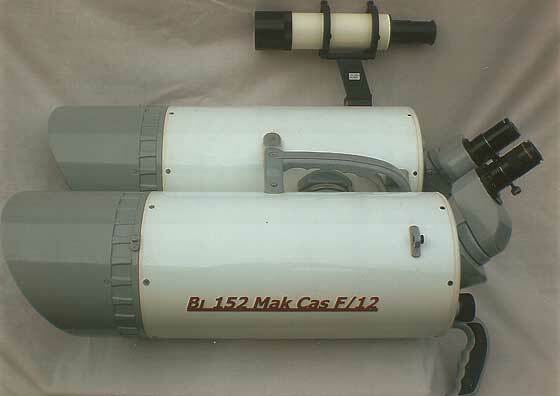 These Russian “Intes Bi 152mm Maksutov-Cassegrain F/12” binoculars are a combined pair of astronomical telescopes. 1.25” astronomical eyepieces can be used and each side has its own focusing knob. The top prism units swivel to alter the PD. 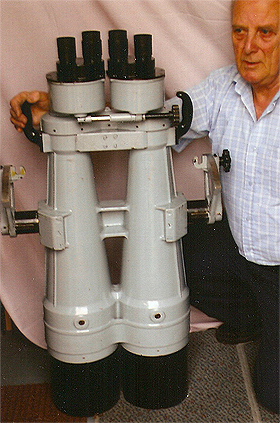 This very large binocular, repaired by Optrep, weighs 13.50kg, is 630mm long and 384mm wide. The very unattractive paint finish on this SOMET 25x100 (45°) binocular belies the fact that it has a superb performance, especially after an Optrep overhaul. It is actually a civilianised version of the famous Carl Zeiss 25x100 (45°) binocular made during WW2 in the Zeiss-owned factory of Feinapparate Bau at Werk Thurn in Teplice, Czechoslovakia (codes blc, then rln and finally flm). 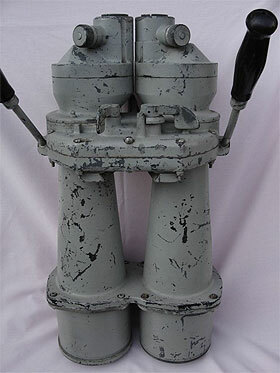 After the war production carried on under the name of SOMET, later Meopta, with the binocular greatly simplified (e.g: air-spaced objectives changed to cemented ones, filters, purging ports and brow pad deleted). The black metal plate covers up screw holes etc previously sealed. 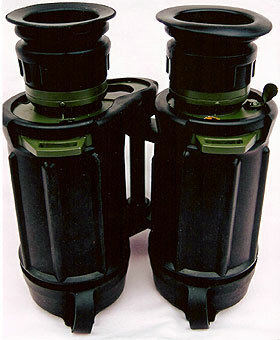 These rugged Russian Baigish 10x42 (IF) are an example of optically excellent binoculars that can be improved by Optrep. Improvements include removal of play from the eyepiece focusing threads, fitting more substantial screws to the eyepieces, purging with nitrogen and, if required, the removal of the military graticule. As one customer, Tom Mansell-Pleydell of Oxford, wrote: ‘…..As ever, you have done a beautiful job – the individual oculars are just right in terms of stiffness vs adjustability, the view sans reticule is so much more enjoyable and they’re now better than brand new. I find these binoculars thrilling to look through; they will be my wet weather friends for many years to come’. 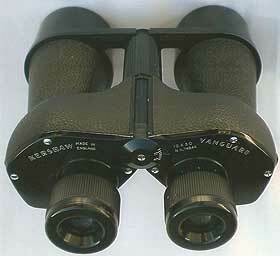 Busch 5-7x22 'Variolux' binocular. The eyepiece arms move in opposition as the wheel is turned, altering the magnification while staying in focus. In fact, it was an early zoom binocular although expensively complicated for a small power range. Each eye is focuses separately by turning the object lens knurled rings. The centre wheel only alters the power. Weight 673gm.